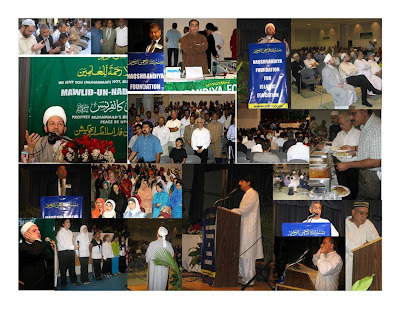 The Naqsbandiya Foundation for Islamic Education celebrated the birth of Prophet Mohammed (PBUH) on Saturday, March 14th, 2009 in Chandler, Arizona with great humility and love. This spiritual event in its sixth year was attended by over 500 people of diversified ethnic Muslim population living in the vicinity of Phoenix, Arizona.The program started at 2:00 pm with the registration of guests. Lubna Ahmed moderated the early part of the program. It included Quranic recitations by Imam Didmar Faja and Nasheeds by Bilal Siddiqui, Yousuf Bhuvad and Mansoor Johar.The choir from the Arizona Cultural Academy also performed Nasheeds in the praise of the Prophet(PBUH). After the Asr prayer, Noor Mohammed Jarral, the guest Nasheed reciter, won the hearts of the audience by his unique delivery of Naats and Qaseeda. Asim meer, who moderated the third session of the program, introduced the key note speaker Shaykh Muhammad Bin Yahya al-Husayni al-Ninowy. Shaikh Muhammad captured the ttention of the audience by his speech on prophet’s life and Sunnah. “We need to evaluate our priorities when it comes to following the life of the Prophet (PBUH). We are in pursuit of wealth, social life, TV, clubs and associations. The lack of importance to Seerah takes away the bundance (Barakaah) of health, wealth and relationship from our life” he said.After the Maghrib prayers, the Shaikh conducted a question and answer session. The audience asked the variety of questions on guidance and Islamic principles.Dr. Ahmed Mirza, the president of Naqsbandiya Foundation for Islamic Education gave a brief background on the foundation and its accomplishments of the past few years. The program ended with Arif Kazmi thanking Dr. Ahmed Mirza and the volunteers for making this event successful year after year. The food was served at the conclusion.